STALLION-Sta. 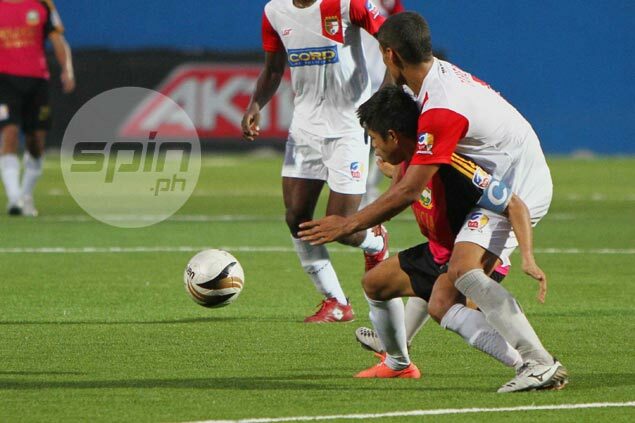 Lucia FC continued to thrive under a new system as it blanked PSG FC, 4-0, to claim the solo lead in the United Football League Thursday night at the Emperador Stadium in Mckinley Hill, Taguig. Hyo Il Kim fired a brace, while Rufo Sanchez and Daniel Matsunaga added a goal apiece – all in the second half for the reigning UFL Cup champions, who scored a second straight rout to gain the full three points. The Stallions are actually tied with Loyola Meralco on top with six points in two games, but a superior goal difference gave the defending champions the solo top spot. “It’s still a new system for us. It’s gonna take us four more weeks to be able to get what we want,” Stallion coach Ernie Nierras said, quick to add that the best hast yet to come for his foreign-flavored squad. The Stallions showed signs of tentativeness in the first half as they failed to unlock the PSG defense. True enough, the Stallions started to get their rhythm as the Korean Kim converted on an early penalty just three minutes into the second half. Sanchez, the Spanish striking sensation, then scored off a free kick volley pass to double the lead in the 73rd minute. At about the same time, Matsunaga, one of three celebrity newcomers in the team, came in for Prince Boley, and the Brazilian-Japanese striker rewarded his coach’s faith by scoring a right-footed goal from the right flank off a nice setup from skipper Balut Doctora. Kim, seemingly the designated penalty shooter for Stallion, put the final nail in the coffin with another penalty conversion in the 82nd. “We’ve been waiting for this game since last year that’s why we didn’t stop attacking even though it was a sure win,” said Nierras, whose club settled to a draw against PSG in its last outing. “We just kept on going. PSG dropped to its second loss of the season.